Perk up your day with our delightful Pear and Spinach Salad with Chicken. The sweetness of the pears combined with the rich flavor of the poppy seed dressing makes this a salad not to miss. 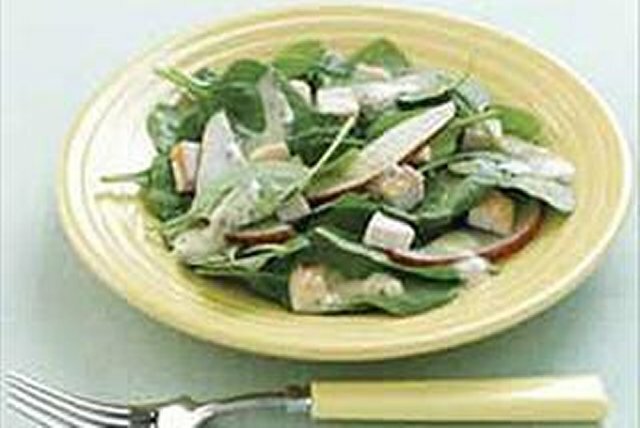 Plus, our Pear and Spinach Salad with Chicken recipe is ready in just ten minutes. What's not to love? Combine pears, chicken and dressing in large bowl. Prepare as directed, using KRAFT Balsamic Vinaigrette Dressing and adding 2 Tbsp. ATHENOS Traditional Crumbled Feta Cheese.